When choosing a dryer one needs to keep in mind which dryer would perform best when loaded with clothes, towels, and bedding and they were rated on energy efficiency, speed, noise, and temperature consistency. 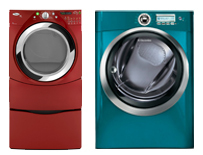 According to the user reviews and ratings the following Dryers are most liked. 1. Whirlpool WGD94HEXW Duet Steam 7.4 cu. ft. Capacity Gas Dryer, 8 Automatic Cycles, 6th Sense Technology, LED Display, 5 Temperature Settings. 2. Whirlpool WED94HEXW Duet Steam 27 inches Electric Dryer with 7.4 cu. ft. Capacity, 8 Cycles, 5 Temperatures, Quick Refresh Steam Cycle, Resource Saver Model, and Quiet Dry Ultra System. 3. Electrolux EIED55HIW 27 inches Electric Dryer With Gentle Tumble, Touch-2-Open Reversible Door, Moisture Sensor, IQ-Touch Controls, 11 Dry Cycles, 8.0 cu. ft. Capacity, Luxury-Dry System, & In Island. 4. LG DLEX5101W 7.3 cu. ft. Ultra Capacity Electric Dryer, TrueSteam Technology, 14 Drying Programs, SteamFresh Cycle, LED Display.